Isaiah Rider, Jr., also known as J.R. was born on 12 March 1971, in Oakland, California USA, and is a retired professional basketball player, best known to have played in the National Basketball Association (NBA) for several teams. He also had a successful college basketball run, and all of his efforts have helped put his net worth to where it is today. How rich is Isaiah Rider? As of late-2016, sources inform us of a net worth that is at $10 million, mostly earned through a successful career in professional basketball. 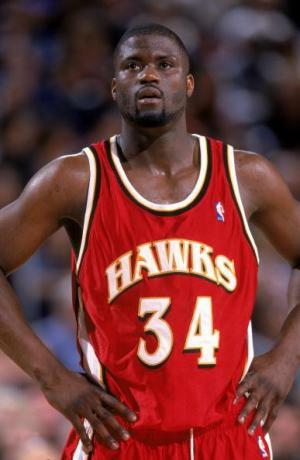 He played for teams such as the Los Angeles Lakers, Minnesota Timberwolves, Denver Nuggets, and Atlanta Hawks. He also had a rap career, and all of these achievements have ensured the position of his wealth. Isaiah attended Encinal High School and would start to gain recognition there, becoming one of the top players of the state. After matriculating, he attended Allen County Community College and later Antelope Valley College where he continued to performed very well, before he moved to the University of Nevada, Las Vegas (UNLV). In 1991, Rider helped the Runnin’ Rebels to a 26-2 record while posting good statistics, and gained national recognition during his senior year when he was named Big West Conference Player of the Year as well as to 2nd-Team All-American honors. However a suspension in his academics barred him from post-season play and contributed to the elimination of the Runnin’ Rebels. Isaiah joined the 1993 NBA Draft and was selected as the fifth overall pick by the Minnesota Timberwolves. He would perform very well in his rookie season, and become a part of the NBA’s All-Rookie First Team. He also won the 1994 NBA Slam Dunk Contest, but in the following seasons his performance started to drop. It was then discovered that he was misbehaving off court, and was later convicted for marijuana possession among other crimes. His behavior led to a trade to the Portland Trail Blazers, where he started scoring well and became the team’s scoring leader. In 1998 he was traded to the Atlanta Hawks, which led to more off-court incidents. He was suspended and fined numerous times which hampered his net worth. He was then released by the Hawks. Isaiah then went to the Los Angeles Lakers, and performed from the bench. He was given a championship ring that season thanks to the Lakers’ championship win even though he did not play during the playoffs. In 2001, he then signed with the Denver Nuggets and only played 10 games before he was waived. After his retirement, personal issues continued to effect his net worth, as he had drug problems and associated assault charges. For his personal life, there is no public information on any relationships, but it is known that Rider established the Sky Rider Foundation which aims to help kids have money for extracurricular activities. He also mentioned in an interview with Yahoo! Sports that his time after leaving the NBA was the hardest as he was battling with numerous issues. His mother was also in a coma during the time he was in prison and it weighed on his mind.